I booked my trip to Singapore in my favorite economy airline, Cebu Pacific. If you have been reading my blog, you might remember a preview of my booking confirmation last July 2012. I booked my trip eight months ahead because of the promo fares. I also wanted to force myself to save. Hence, booking a flight months before provided me ample time to gather my shopping travel funds. Some of my friends would always discourage me to avail of economy airlines. They would always tell me, if I pay peanuts, I'm allowing myself to suffer from cheap services. True to some extent, but I really don't mind. After all, most of my destinations don't require long haul flights. Although I have a dream of traveling via business class, I guess that can wait. ;) For now, I can always settle with my limited budget. Despite Cebu Pacific's negative reputation of having delayed flights and inefficient services, the airline haven't failed me in my last three trips. In Taiwan, I was transported way ahead of time. In Hong Kong, my friends and I arrived just in time. I wanted to become a living supporter of Cebu Pacific, not until everything was ruined in my Singapore trip. It was my first time to experience more than an hour of flight delay. I experienced both problems in my arrival and departure schedules. My expected arrival time in Singapore is 4:45 pm. Since the flight was delayed, I arrived past 6 pm. I caused a lot of worries to my friend who fetched me from the airport. I really hope that Cebu Pacific will cooperate with the government to address the always overused excuse, air traffic. Aside from the airline problem, I almost thought that I will not be allowed to leave my country. The local immigration officer pissed me off. In my past trips, I always smoothly pass the Immigration Officer's screening. I wasn't asked to present any other requirements. However, my Singapore trip gave me some unnecessary stress. I was suddenly asked to present my company ID. Unfortunately, I didn't bring my ID because I don't find it necessary. I also want to avoid the risk of losing it in another country. Hassle. Since I don't have my ID, I was asked to present other proof of employment. I showed my company provided business card and continued to interrogate me as if I'm planning to engage to an illegal venture. I felt insulted and humiliated. In the end, I guess my travel history saved me. My passport was finally stamped. My message to the Immigration Officer, you don't need to threaten and stress everyone to accomplish your job. And my advice to other travelers, please bring all possible company IDs to prove that you are employed, decently earning and have no plans of messing up your hard earned travel reputation. Contrary to my annoying experience, Singapore's Immigration Officer rendered a very quick service. No questions asked, the accommodating immigration officer stamped my passport with a smile. Thank you Madam. After all the hindreances I encountered, I met my friend who adopted me in my entire stay in Singapore. I was spared from the hotel expenses. Thank you Ate Mitch! More than giving me free accommodation, Ate Mitch even treated me to my first meal in Singapore. Toast Box is the best! I love the spicy Laksa and Iced Barley. We have Toast Box in the Philippines but they have a few branches and a bit expensive. 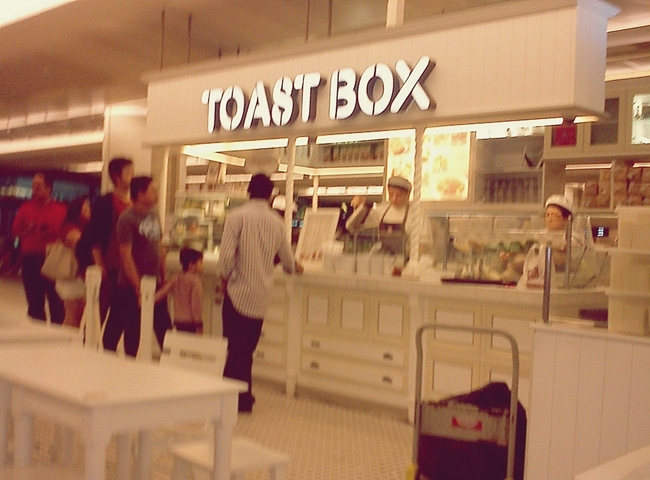 If not because of my SG trip, I wouldn't have the chance to experience Toast Box. I have four days to spend in Singapore. We originally planned to visit the Orchard, Singapore's famous shopping hub. However, since it was already too late, we went to Starbucks and took home my favorite souvenir. I slept early to prepare myself from the anticipated tiring day at the Universal Studios Singapore (USS). Much of my first day was spent in USS. But let me reserve that in another post. What I intend to show here is my solo travel adventure. May I repeat, SOLO! Something happened and I was left out to explore Singapore on my own. Here are a few pictures of my perfect solo adventure. I always thought that Singapore is heavily occupied with buildings, establishments and different structures. I held on to this belief because the country occupies a very limited land area. Much to my surprise, Singapore has so many open spaces. I took their MRT's red line and was surprised to discover areas that seem to look like an unexplored forest. I believe that the excellent urban planning made Singapore what it is today. I hate to say it but it looks like Singapore is more conducive for living than the always crowded and populated Manila. If given the chance to work and stay longer in Singapore, I would take advantage of the parks that are very suitable for jogging. During my lone time in Singapore, I ensured that I will be able to take their Euro V compliant buses. Singapore is the first country in Southeast Asia to purchase the "green" or the environmentally friendly vehicles. Buses arrive on time and what I appreciate best is the absence of heavy traffic. It was a huge relief as I always battle this problem on the way to work. Aside from buses, the best way to explore Singapore is through their efficient train or MRT. At first, I felt intimidated and confused with the different lines. But when I was already navigating the stations and the connecting lines, I realized that it everything was perfectly organized and systematized. This free map provided in every station helped me a lot. My solo journey in Singapore led me to the Orchard. I didn't explore the entire place because I went there the night before. Truth is, I just dropped by Ion Orchard to buy the blouse I spotted from H&M. Haha We don't have H&M in the Philippines so I have to ensure that I will have one in Singapore. 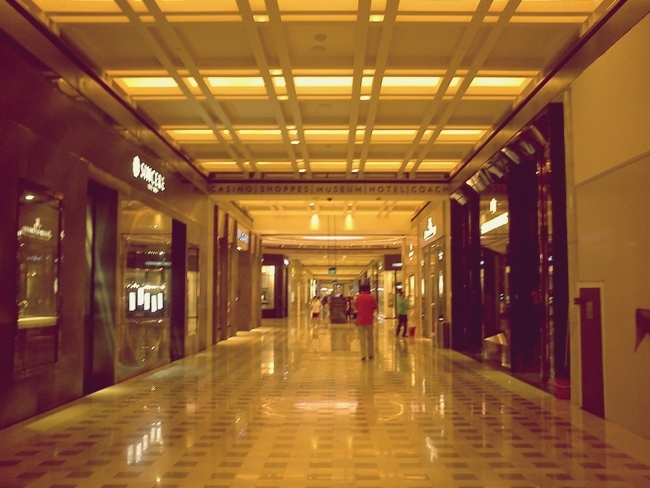 When my shopaholic impulse was fulfilled, I headed to the famous Marina Bay Sands. Just look at the glossy and illuminating floor tiles and intricate ceiling designs! The mall provides a view of Singapore's equally picture perfect harbor. I was almost contented exploring the Marina Bay Shoppes not until I saw this towering escalator. I finally saw up and close the famous Marina Bay Sands Singapore. I hate to admit it but Gardens by the Bay can be better experienced during night time. I got myself toasted and roasted as I explore the place. Tired from my own walkaton adventures, I headed to Marina Bay Sands for the last attraction, the Sky Park. The Sky Park provides guests an aerial view of Singapore's landscapes. The experience was great except for the SG $ 20 that needs to be shed out. If you can stand the scorching heat of the sun, I recommend trying the Sky Park during day time. However, after my first time experience here, I believe that the Sky Park is best experienced late afternoon to evening. After what seems to be an endless walkaton adventure, I headed inside the hotel to get my own decent photo. I don't have problems of traveling alone. The only disadvantage is the difficulty of getting a perfect picture of yourself. Unless you have your own tripod or monopod, there are actually no problems. In my case, my solo travel attempt was an unexpected circumstance. I wasn't prepared and equipped. Fortunately, there are tourists and courteous employees who took time to answer my photo request. Otherwise, I would have ended up with a collection of this frustrating and pathetic photo. Nevertheless, I'm still proud and happy because I was able to see and explore Singapore on my own. Except for some occasional photo shots, I don't have to distract and bother other people to fulfill my dream. My Singapore travel adventure is not yet over. There are more photos and experiences to share. On my next post, I'll write about my experience at Singapore's famous theme park. Singapore is always worth a trip - I've been twice, but I'm very sorry you encountered the hassle getting there! Boo to the rude immigration officer. I think he just wanted to use his authority on you. I have experienced such situation myself too (in Indonesia). But I'm glad you had a brilliant time anyway. The Mall looks stunning! Thanks for sharing, Diane. Have a wonderful Easter weekend!!! I was relieved to hear that I'm not the only person who experienced "rude" immigration officers. Well, the rest is history. Happy Easter too Duni! Hi Diane! Singapore is a place my husband has always wanted to go there and of course I'd go too! Looks so pretty! I hope you're doing well. The whole fam will be in SG soon! The Marina Bay Sands & Universal Studios are in our list of places to see. Your pictures of the former got me all excited na. :) i hope though we wont encounter similar problems re flight delay & immigration. Traveling by CebuPac, too. Looking forward to hear your SG experience too. Wow Diane, what an amazing adventure! Hopefully that will be your last time having to deal with problems in immigration. Your pictures are so interesting and I just can't believe the fabulous architecture. It made me dizzy just looking up at the Marina Bay Sands. Thanks so much for sharing. Your pictures are so beautiful, Diane! Even though your trip got off to a bit of a "rocky" start, it looks like you had a wonderful time. Singapore looks truly lovely.